Solih, candidate from the coalition of opposition parties, calls for ‘just and peaceful society’ after claiming victory. Maldives opposition has claimed victory in the tense presidential election after its officials and an independent newspaper reported results from 90 percent of the ballot boxes which showed Ibrahim Mohamed Solih bagging 58 percent of the votes. Solih, candidate from the coalition of four parties, whose leaders are either in exile or imprisoned, claimed victory in a televised speech on Sunday. “We have won this election with a comfortable majority,” Solih told reporters in Male. “This is a moment of happiness. This is a moment of hope. This is a moment of history. We will establish a just and peaceful society in the Maldives. I will be a president for all Maldives. Yameen, who was reportedly lagging behind with 42 percent of the votes, has not commented on the results. Ahmed Nihan, a senior ruling party official, earlier told Al Jazeera it was too early to declare a winner but the Progressive Party of the Maldives “has the courage to accept the citizen’s say, regardless of whether we win or lose”. We have proved we are capable of facilitating an orderly vote,” said Nihan, adding that the opposition’s claims of vote rigging prior to the election were “baseless”. Sunday’s election, considered a referendum on democracy in the troubled island nation, saw Solih run against incumbent president Yameen who sought re-election with a pledge to boost Maldives’ economy after a first five-year term marred by allegations of rights abuses and corruption. 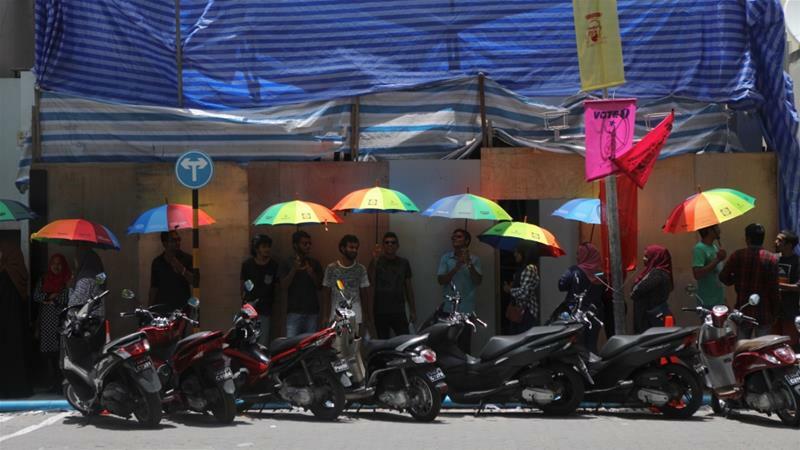 More than 250,000 people in the Maldives, out of a population of 350,000, were eligible to vote in Sunday’s election. Voting was also taking place in Kuala Lumpur and Sri Lanka. Following Solih’s speech, jubilant supporters celebrated on social media as well as the streets of Male. Hundreds gathered in front of the opposition’s campaign office despite heavy rain, congratulating each other and exchanging hugs. Speaking from Male, journalist Junayd Mohamed told Al Jazeera that Solih and his team are present at the office and will stay there until the election commission announces provisional results. “We’re continuing to see Solih hold on to his strong lead after results were announced from 463 out of the 472 ballot boxes,” said Mohamed. Aishath Sheeza, 50, who said she was arrested several times for protesting against Yameen’s government, was “euphoric”. Watching results on national television in the Maldivian capital, Male, Dhahau Naseem said she was “ecstatic”. “Perhaps there is no way out for Yameen this time,” said Naseem who was “scared of being optimistic about positive results” ahead of the election. This was “given Yameen’s refusal to tolerate any dissent in the past”, according to Naseem who was referring to the president’s declaration of a state of emergency in defiance of a Supreme Court ruling in February, which ordered the release of jailed dissidents. The emergency decree was Yameen’s second in five years. Within hours of the declaration, security forces arrested two out of the five top court judges on charges of plotting a coup. Yameen’s half-brother, Maumoon Abdul Gayoom, who ruled the island nation for 30 years, was also arrested. The three were later jailed on charges of obstructing justice. Very good outcome for Maldives. Chase out the man who was selling island by island to to foreigners and pocketing money. Should catch him and recover money. This entry was posted on Sunday, September 23rd, 2018. You can follow any responses to this entry through the RSS 2.0 feed. You can skip to the end and leave a response.